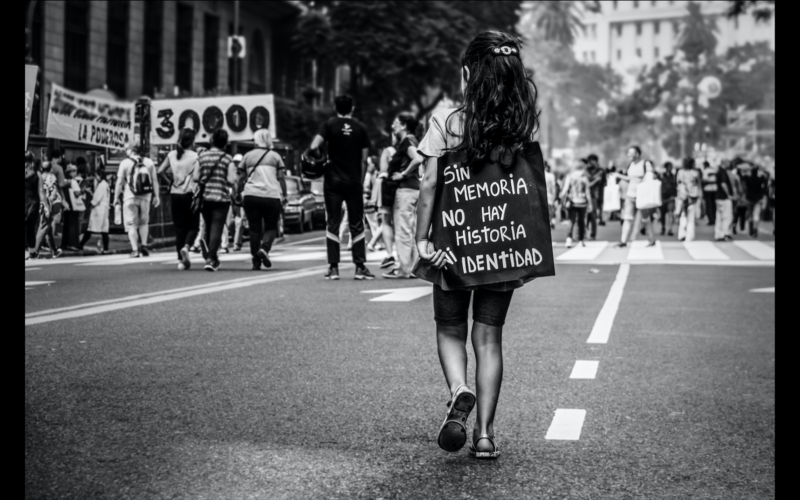 “Sin memoria no hay Historia identidad.” (If there is no memory there is no identity). Every photo taken by Maria Horton explores and highlights the issue of the 3,000 lives that were stolen during her country’s military dictatorship. 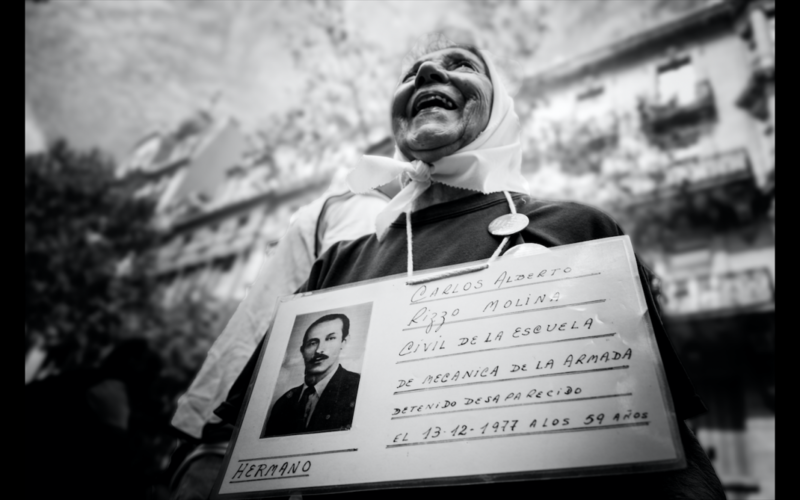 “Through my photography, my ultimate aim is to try and raise awareness, trying to show the world what happened in Argentina and ultimately ‘to hold the memory of the lost 3,000 citizens’,” she says. Horton, an Argentinean photographer who lives in Buenos Aires, has tried to work through her own personal family trauma with her artwork and exhibits photographs via social media and galleries in Argentina. Her grandmother, Julieta Horton, was a victim of the dictatorship. Julieta lost one of her children – stolen by Jorge Rafael Videla’s army. One evening they were all asleep; someone knocked at the door and asked for her son to get changed, then the police took him. His name was Miguel Angel Horton, aged 17. He has been missing since June 30, 1977. Maria’s grandmother died, never finding her son or getting the answers she deserved. “If we don’t, who will? Our sons and daughters will forever be forgotten. Without our memories and fight, their identities will be lost with them” says Isabella Alberto, a 66-year-old mother who is yet to be reunited with her son. At each march a range of different generations congregates together to raise awareness on the issue. The “fight is no longer with the government” but with the world itself. During the late 1970s Argentina was governed by a military dictatorship. From 1977-83, it is estimated up to 30,000 people, many of them young children, went missing according to the official report by the National Commission on the Disappearance of Persons. Since then, an organisation called ‘Madres de Plaza de Mayo’ (Mothers of May Square) have been searching for the children stolen and illegally adopted during Argentina’s so-called ‘dirty war.’ The mothers gathered in Plaza de Mayo, the epicentre of politics in Argentina, to demand answers for their missing children. That first march was a small group of roughly around 14 mothers and grandmothers. Today, hundreds of Madres now meet every Thursday around the square, demanding to know the fate of their children. There are DNA banks scattered around the country trying to reunite individuals who have questions about their identity. It is estimated that so far, only 20% of families have been reunited. The situation in Argentina is not getting any better. Bereaved families do not feel like they are given the respect or acknowledgement that they deserve. In July 2017 there was an uproar with the current government. Mauricio Macri, the president of Argentina, refuses to express his views and opinions. “In much of my work, you will see women marching with white scarves over their heads. Each of them wears the white headscarf of the Madres. In 1977, people were not allowed to gather and demonstrate, or show opposition to the dictatorship. So, they just went walking with their white cloth nappies tied across their heads,” explains Horton. Mothers today wear their white scarves, covered in the names of the missing people along with candles and pictures of the missing. Julieta Horton was one of the first hundred women to march every Thursday, but she died without answers. Whether he is alive is still a mystery, yet Maria marches every Thursday capturing the emotions and documenting the search. Her grandmother was “never able to move on, she lived in the hope that one day, Miguel would walk through the same very front door that he was taken from.” Her grandmother kept the house the same, his room identical to the way he left. Featured image: Sin memoria no hay Historia identidad by Maria Horton.